Two of the most observed traditions of St Patrick’s day are probably pinching someone who isn’t wearing a bit of green and knocking back a couple of green beers. Ok – those probably aren’t the most popular St Paddy’s Day traditions, but they certainly seem to be ones that people enjoy! I personally like to celebrate with a little bit of Irish Food, like corned beef, braised cabbage and some homemade baked goods. I’ll always do an Irish Soda Bread. These loaves are easy to make, since they’re leavened with baking soda and not with yeast. there are many variations on the traditional loaf, and I like mine slathered with Irish Butter. Soda Bread Farls are another great variation on this type of bread, baked directly in a skillet instead of in an oven. Irish cream makes an appearance in many of my desserts for St Patrick’s Day. Irish Cream Brownies and Bailey’s Cheesecake Bars aren’t exactly traditional desserts, but they’re delicious none the less. Irish Coffee is a good pairing with an dessert. I would do more green desserts, but green is one of those colors that doesn’t always flatter foods that aren’t naturally green. That said, there are some green dessert ideas out there. Homemade by Holman made some absolutely amazing Shamrock Sandwich Cookies. These dark green cookies are soft and cake-like, so these sandwiches are really a variation on whoopie pies. The secret to making them is piping out the cake batter into clean shamrock shapes before baking them. Nutmeg Nanny whipped up some Green Velvet Cupcakes for the holiday, too. Like the whoopie pies, these also use green food coloring with great effect. Keep in mind that it is a good idea to go with a lot of food coloring; the brighter the color the better your green sweets will look. those shamrock cookies look awesome, like whoopie pies! enjoy st. patty’s day! my fave st. patty’s day ever was spent at epcot center – highly recommend it! Those shamrock cookies are so cute! This year I’m going to try and make homemade Irish cream for Saint Pat’s day, wish me luck! nice to see how Kerrygold has been developed! Kerrygold is one of many trademark which is above in 70 countries represented. Did someone try the baguette or the cheese? Thanks for choosing my shamrock sandwich cookies to feature! I’m honored! 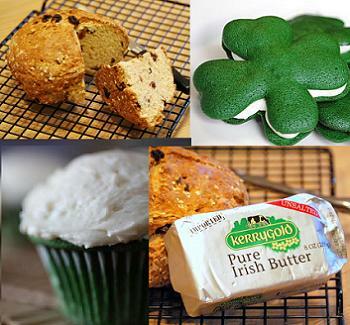 Great baked treats for St. Paddy’s Day…. just wanted to thank you for your rainbow cupcake idea you previously posted. I made them, added a vanilla buttercream on top with shamrock sprinkles and a gold coin….. thanks so much, they were loved by all!! We just tried the Irish Cream Brownies, so good. Thanks for the recipe!! So many treats…so little time. Thanks for the tempting round-up of St. Patrick’s Day recipes. I made the shamrock sandwiches and put vanilla icecream between the wafers. It was pretty good.